SEO search engine optimization a basic need of every website/blog in today’s time. Most of us have hard about both On-Page SEO and off-Page SEO. 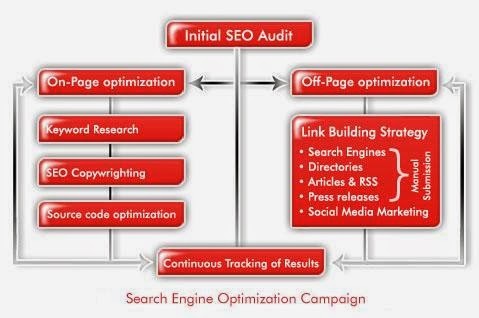 On-Page SEO is that in which you edit on your website coding in template. Off-Page SEO is that in which you do a little work to market your website on the internet. Hearing a word SEO makes us feel both excited as well as nerves. Excited because we know that SEO makes your blog rank higher in Google search and Nerves because we think is my Site SEO optimized? So today I am going to explain what exactly you have to do in Off-page SEO as well as in On-Page SEO. On-Page SEO includes several points which make your website SEO Friendly and get indexed in Google search Engines. The first and most important thing of your blog is the brand name. Have a solid brand name for your website is most important. A page title must be if possible a Keyword relating to your blog niche. Page title should be relevant to the content on the website. Bing: - 65 characters long. Google although have not a fixed length of page title. But it’s a 70 character long tail keyword title which can be displayed in Google Search Engines. Keyword can be of any length but below 70 characters. Two Keywords in one line is good. Keep the Keyword Ratio of 2-3% in each article/post of the website. More than this will come under keyword stuffing and won’t do any good to ranking your website. Meta Tag Description refers to the Description that appears on the Search Engines below your blog title and website URL. A Meta Tag Description can be 150 characters long and should be coded into HTML of your website. In Description you can insert High paying keywords which will help in better search result ranking.Describe your website elaborately in these 150 words because most of the visitor actually read your website description. Including keywords in URL of your post is the best way to ensure that your article is listed on top of the search query. Use (-) to separate each word in a URL. This represents that the URL is SEO friendly. Image alt means showing alternative text instead of image when ever the page is unable to load the image. This also helps in search ranking as if you have placed a keyword in the image alt tag your website will be showed on the search result. Off page SEO technique that really make a big impact on your blog ranking. Although In a research it’s made clear that Social Share Do not Indicate Google Ranking, then also sharing your content social is most important. Building connection with other bloggers of the same Niche is really important in blog spear. Link building refers to getting quality back-link for top PR weblog and website. Cross Linking refers to internal linking of existing article on the website. You can Show similar Article at the bottom of each article so that, people refer to those also after finishing the current one. Go make a You-Tube video to promote your stuff online. Most of the bloggers adopt this technique to increase their website traffic. The above mentioned tricks will surly get your blog going to the rankings of Google search Engine. If you have tried all of the above tricks then its time to wait and watch your website be more productive and get massive traffic.